Are You Sitting All Day? Why This Is Dangerous And What You Can Do About It. We were not meant to sit for long periods of time. We are built for standing and moving. Or lying down when we sleep. But sitting is an unnatural position for us. It can cause many health and mobility issues. Fortunately, there are some ways we can counter act the negative effects of sitting all day. In the seated position, our hip flexors are in a flexed position, whereas they should be in an extended position, such as when we are standing. The problem here is that our hip flexors become short and tight. This tilts the pelvis forward, which is a major contributor to low back pain. Sitting for extended periods also causes rounded shoulders, where the chest muscles at the front can become short and tight. And the muscles of the upper back can become too lax. On average, we spend up to 14 hours sitting down every day. The human spine has an S-shaped form for a reason: it can withstand strains. However, in a sitting position, an S-shape turns into a C-shape. When a person slouches, stomach muscles become weaker and can hardly hold a proper body form without regular training. When you’re sitting down, the strain is transferred to the pelvis and vertebral spine, causing the pressure on intervertebral discs to increase. Constant straining causes the entrapment of the cervical vertebrae and can eventually lead to the decrease of blood flow to the brain. As a result, a person can experience headaches and blurred vision. The spine is a framework for all inner organs, which is why it’s crucial to keep it straight without putting constant pressure on it. Constant slouching combined with lack of physical activity can make your body’s muscles weak and flabby. Most affected are your abdominal and gluteal muscles. But muscles aren’t the only thing that suffer during a sedentary lifestyle. 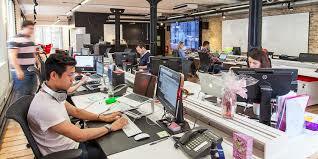 Another possible consequence of sitting behind a desk over time is osteoporosis. While bones don’t actually have much difficulty holding the body in a seated position, they can lose strength over time, becoming more porous and fragile. Too much sitting also seems to increase the risk of death from cardiovascular disease and cancer. Sitting in front of the TV isn’t the only concern. Any extended sitting — such as behind a desk at work or behind the wheel — can be harmful. A life of continuous sitting weakens the muscles, deteriorates blood circulation and lowers the tone of blood vessels. A lack of physical activity is one of the main reasons for early atherosclerosis (a build-up of cholesterol plaques in the blood vessels of the heart). Also, an imbalance between the oxygen supply and consumption can occur, where the heart needs more oxygen than the blood is bringing. A study of more than 17,000 people over 13 years showed that people with sedentary lifestyles have a 54% greater risk of dying from a heart attack than those who are more active. People who spend most of their day sitting at a desk suffer from a bad blood circulation in the lower limbs which can cause varicose veins. While both genders can develop them, women are more likely to suffer from them. In addition to varicose veins being hereditary, they can also appear after sitting over long periods of time with your legs crossed. The act of the veins getting squeezed leads to the congestion of blood in different areas. Poor blood circulation is also dangerous because it can lead to the development of blood clots. A clot can easily block up a vital blood vessel in the heart, lungs, or brain. Carrying excess weight is one of the biggest consequences of a sedentary lifestyle. When sitting for prolonged periods of time, the metabolism slows down and your body burns fewer calories, storing the excess as fat. As soon as a person sits down, the body lowers the fat burning process by 90%, their insulin level falls, and blood pressure increases. Over the past 50 years, a majority of jobs have changed with the times and now require more sitting behind a desk — which means no time to burn calories. 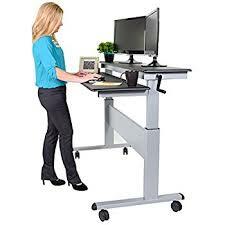 At a standing job, your body burns up to 35% more calories than at a seated desk job. The pancreas releases the amount of insulin necessary to transform carbohydrates into glucose. However, the cells in the passive muscles need a much lower amount of insulin, while the pancreas releases it at its regular speed. Studies show that just one day of sitting down leads to a reduced uptake of insulin by the cells. As a result, a predisposition to diabetes and other diseases is likely to develop. A sedentary lifestyle can also cause other unpleasant diseases like chronic constipation or in extreme cases, hemorrhoids. Telomeres are situated on the ends of chromosomes, protecting them from any damage. Telomeres become increasingly shorter during the aging process. An inactive lifestyle has been proven to cause telomeres to become shorter much faster, accelerating the aging process significantly. While sitting may feel comfortable, every hour of doing so can cost you two hours off your life. A sedentary lifestyle can have a very negative influence on mental health. The absence of physical activity leads to the development of depression and anxiety. According to research, constant sitting causes the lack of endorphins (‘feel good’ hormones) that physical activity and training usually boost in your body. Engaging in regular exercise can greatly improve your mood and relax the body. It also can improve self-esteem and self-confidence. In addition, physical activity influences the production of serotonin, helping to curb an imbalance that could lead to depression, memory problems and lack of appetite. Lack of movement can influence the quality of your sleep. Your body interprets constant sitting as rest, even if your mental activity is at its peak. Therefore, if you’ve been “resting” for the whole day, your body decides that you no longer have a need for sleep and relaxation time. Regular exercise helps you to get rid of insomnia and improves the quality of your sleep. Men with inactive lifestyles are more likely to suffer from erectile dysfunction, prostate problems, and hormonal imbalance. When a man spends many hours in a row sitting down, the blood circulation in the small pelvis slows down and can eventually lead to inflammation and the development of more serious diseases. With lack of movement, fat deposits become larger, oftentimes resulting in a hormonal imbalance. The female hormone, estrogen, is produced in fat tissues — which explains why men can develop pot bellies that are nearly impossible to get rid of. The solution seems to be less sitting and more moving overall. You might start by simply standing rather than sitting whenever you have the chance or think about ways to walk while you work. For example: Stand while talking on the phone or eating lunch. Go for a walk with your colleagues rather than gathering in a conference room for meetings. The impact of movement — even leisurely movement — can be profound. For starters, you’ll burn more calories. This might lead to weight loss and increased energy. Even better, the muscle activity needed for standing and other movement seems to trigger important processes related to the breakdown of fats and sugars within the body. When you sit, these processes stall — and your health risks increase. When you’re standing or actively moving, you kick the processes back into action. Stretching the muscles most affected (chest / hip flexors) by sitting all day will go a long way to counter-act the damage done. It is also a good idea to do a stretching routine for the entire body, with emphasis on the neck and forearm (if using a keyboard) muscles. Also emphasise any muscles that you know are tight. If you must sit for extended periods. sit correctly. 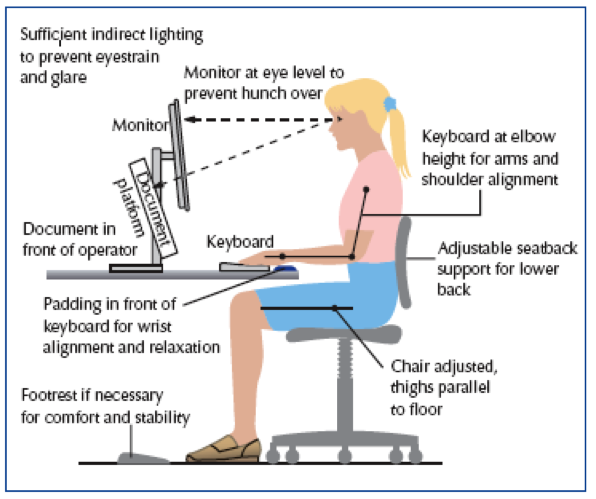 This diagram gives some excellent pointers regarding good desk ergonomics. Why contact us at Lifegym and we can do a movement analysis and tailor a mobility / flexibility routine to your lifestyle? It may only take one visit and with three to 10 minutes spent stretching at your desk each day, we’ll have you moving like a ninja in two weeks! Health & Fitness, Mental Health achievement, Body Shape, Energy, Fitness, Flexibility, Focus, Goals, Health, mobility, Personal Training, Posture, Quality of Life, Sport, Weight Loss. permalink.